Cut each bread slice diagonally into 4 triangles. Arrange half of the bread triangles in ungreased rectangular pan, 13x9x2 inches. Top with vegetables. Sprinkle with cheese. Top with remaining bread. Beat remaining ingredients with hand beater or wire whisk until well mixed; pour evenly over bread. Cover and refrigerate at least 2 hours but no longer than 24 hours. Heat oven to 325°. Cover and bake 30 minutes. Uncover and bake about 45 minutes longer or until knife inserted in center comes out clean. Let stand 10 minutes before cutting. 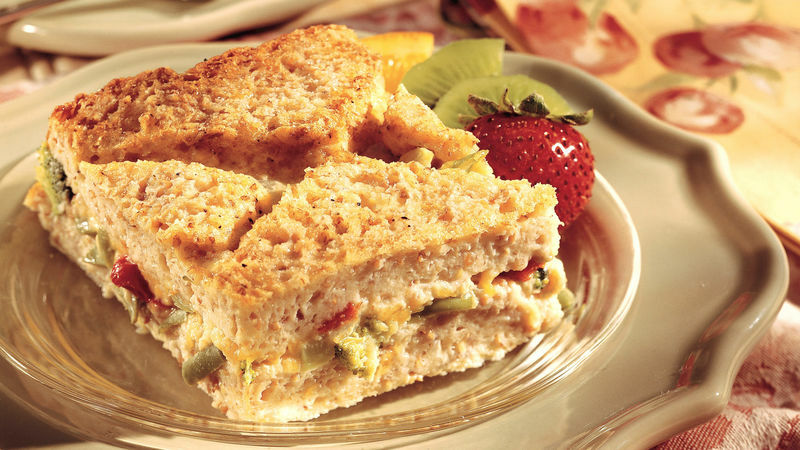 This strata can be put together the evening before and then baked in the morning. It's a make-ahead dish that's ready to bake without any last-minute fuss.